STEM education, as well as education as a whole, could benefit from pivoting away from presenting content in highly focused silos centered around isolated disciplines. After all, what time do you start your mathematics each day? What day do you reserve for critical thinking and problem-solving? How much time do you allot yourself to investigate connections between the past and your world today? These questions are ridiculous to any adult. The examination of life is not divided into segments in which content and skills are relegated to specific times or days. So, why do we teach students in this way? In the larger world outside of education, we use content, ideas, skills, and strategies across disciplines to make sense of situations, solve problems, and complete everyday tasks. These are skills that drive our careers. Our pathways are not directed by the disciplines, but by larger concepts or ideas that utilize all the disciplines and their associated skills as tools to achieve success in our endeavors, whatever they may be. Classrooms across the nation have to live beyond just theory, implementing pedagogy in practical instruction. Transdisciplinary instruction doesn’t happen overnight. It takes thoughtful planning, robust examples to reflect upon, continual practice, and professional development. Discovery Education supports educators in taking steps towards practical application of this type of instruction through Discovery Education STEM Connect, a resource which helps the classroom walls fade away and opens the world to students. 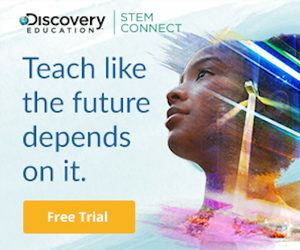 Discovery Education STEM Connect is a cutting-edge interdisciplinary K-8 resource designed to enhance core curriculum and bring STEM to life in your classrooms.